Nehru Place market is two markets fused in one and these two markets are totally irrelevant to each other. On one hand, you have one of India’s biggest electronic markets and on the other side lies the famous flea markets of Nehru Place. Traditionally Nehru Place market is known for its infinite range of electronic items. Every shopper in Delhi who wishes to buy a new computer, laptop, a printer must visit the stores in Nehru Place. They are believed to offer a cheaper deal on the similar product. The Nehru Place is home to all sorts of gadgets. If you are looking to buy a new VR or a new TV for your home or be it any electronic item, Nehru Place market has it all at a cheaper price. Amidst the chaos of shopkeepers yelling at you to get you interested, you will find many shops dealing in repairing electronic items. It’s not everywhere you find the retail outlets and repair shops, but that’s the forte of Nehru Place. There are also various small repair shops that provide all sorts of computer assistance, ranging from regular services to repairing major damages. The upper floor of the buildings comprises of offices and service centres of various mainstream brands. 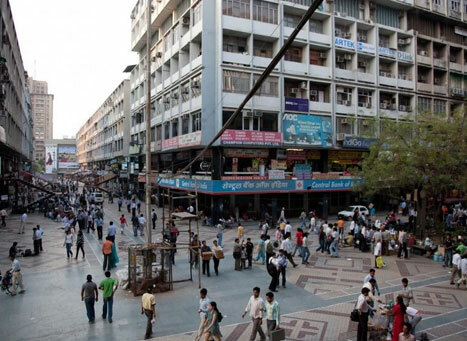 While Nehru Place is a famous tech and gadget market, there is also a flea market within the market complex. The flea market of Nehru Place is one of the many cheap flea markets in Delhi. If you are looking for a cheap range of clothing, Nehru Place flea market is your spot. The small local vendors sell daily usage clothing items at a very affordable price. You can buy cheap t-shirts, shirts, Jeans and trousers for both men and women. Not the most diverse market, Nehru Place flea market serves to your basic shopping needs. Common to all flea markets in Delhi, Nehru Place flea market is a test of your bargaining skills. The final price of any product would depend upon your bargaining tactics. The Nehru Place, traditionally known to be a tech market has got multiple aspects to it. One of the best places to eat in Delhi, the only way to know everything about Nehru Place is to explore it yourself. Nehru Place Metro station on Magenta Line of Delhi Metro is the nearest metro station to Nehru Place Market. Nehru Place market serves as an absurd shopping destination in Delhi. Nehru Place is India’s biggest electronic market, specialising in laptop and computers. You can get all kinds of electronic gadget and there are numerous service centres of tech companies like Dell and HP. Also, there is a clothes market within the Nehru Place area where you can buy cheap daily use clothes at a reasonable price. The Nehru Place market opens around 10 and closes by 7 pm. The tech market is closed on Sunday however, the flea market is open on all days of the week.